Your website’s colour scheme is one of the strongest non-verbal ways in which you can make an impression on the reader. There have been all sorts of psychological studies done on the messages that individual colours convey. OK, so they can seem a bit of a cliché sometimes – dark navy represents authority, scarlet shouts passion and energy, and pink is genetically embedded into the colour preferences of girls aged between four and eleven. But just because they’re clichés, it doesn’t mean to say they’re not true – or that you can afford to dismiss them because you have a strong preference for lime green text on acid yellow. This is only part of the story, though. The full picture is far more nuanced than that. Think about green. Does it mean freshness? Or putrefaction? It depends on the shade of green you choose, of course. But it also depends (and this is important) on the context of other colours that you set it in. A particular shade of green may work very well with brighter greens, yellows and reds to create a fresh-looking colour scheme. But it may also work equally well with browns, purples and ochres to create a rotten-looking one. So unless you’re planning to have a website that’s just black-and-white, with no more than one accent colour, it’s worth taking some time and trouble to pick a colour scheme that creates the response in your readers that you want to evoke. Don’t forget usability while you’re at it. Some colour combinations may be very pleasing on the eye overall, but may make it hard for the user to read what you’ve written, or to distinguish links from headers or plain body text. Others are just plain off-putting, like the horrors of white text on black background, which only looks good to those stuck in a teenage timewarp. When you’re choosing colours for a blog or any other kind of website, I find it really helps to look at some colour palettes. These are good for giving you ideas. Sometimes they put colours together in ways you might not even have thought of doing. Here are some of my favourite places for getting colour ideas. This is usually my first port of call. As well as a great variety of excellent palettes, they also offer colours with hex codes. For a non techie like myself, I particularly like the way their site search engine works so you can input words, eg petrol blue, and they’ll come up with palette suggestions including your choice of colour. This is a good place for colour combos (combinations or palettes) and showing which colours will work well together on screen. Also, if you see a colour you like from their large range of popular colours, you can find the hex code for it here. This is an interesting place. You can input an image and it returns a couple of palette suggestions for you. Sometimes the results can be quite unexpected (more like “odd” occasionally) but it’s quite fun to try. If you’ve already chosen an image, say a photo or some artwork, as the basis for the site’s feel and look, then you enter the URL of the image into the box, hit the “Color-Palette-ify” button, and hey presto! There are the palettes – one in vibrant shades, one in more muted tones. It’s free, so if you don’t like them you can just move on. They have other free tools on there too and some games. 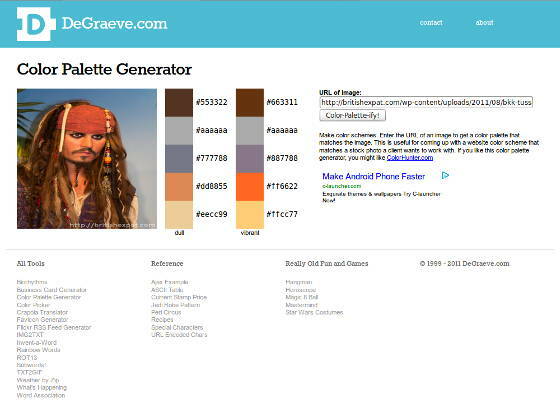 I’m not so keen on them so I only visit their site for the palette generator. Why not have a look? 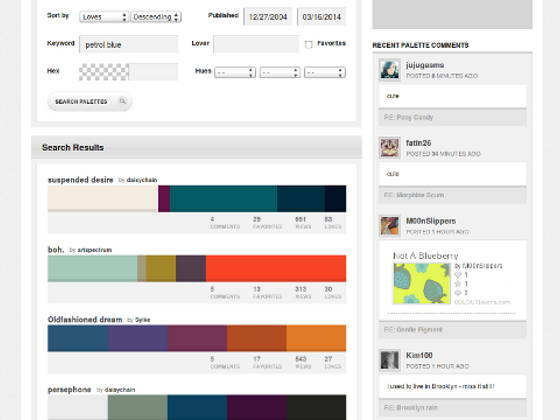 Do you have your own personal favourite site for colour inspiration? Please feel free to comment!